I think of this wholesome, one pot, warm bulgur “salad” as being a suped-up version of tabbouleh. I love the fact that this meal is all chopped, thrown in a pot, and cooked within 30 minutes. It’s fast, simple, delicious and nutritious. It pairs great with my Citrus Tahini Salad dressing, which you can whip up in advance and store in a jar in the back of your fridge. Pull it out when you need to add a bit of jazzing up to your green salad, tabbouleh or this warm bulgur salad. Packed with protein and fiber, bulgur is a whole wheat and used in place of rice in parts of the Eastern Mediterranean. It’s low in calories, but packed with nutrition. 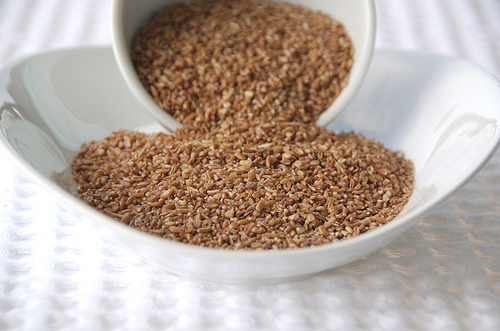 One cup of bulgur has less calories, fat and more than twice the fiber and protein of brown rice! So please – get very familiar with this “super food” and enjoy! Add the onions and cook until lightly translucent. Stir in the tomatoes and basil, cooking 2 more minutes. Stir the bulgur into the tomato mixture, making sure that the bulgur is well coated. Stir in the broth. Bring to a low boil, then reduce the heat to low and cook, covered, for 5 minutes. Add the tomato paste, salt, pepper, paprika and cayenne to the bulgur mixture. Continue to cook, covered until the bulgur is tender and all the liquid has been absorbed, about 25 minutes. Turn off the heat and let sit for 10 minutes. Sprinkle the parsley & feta over the top. Have you tried to make this meal? I’d love to hear from you! Drop me a line below and Unleash your Inner Aphrodite. . .